This was our reason for choosing Spain as our holiday destination and so we were happy to see our hotel room view was Port Aventura (in the distance). We could see Shamballa and Hurkan Condor rising high above the rest of the landscape. Pictures coming soon! We look so happy as we are sat in the front seats of this ride. It was luck but also a really lovely ride attendant who helped us out. We were at the front of the queue line, trying to not get our hopes up that we would get the front, when the fast trackers were let in first. I groaned as a good three or four couples entered before us. All took back seats though beside one guy who was trying to persuade his buddy to do the front row. As the ride attendant let us in this guy left his friend and took the front row on his own. I just stood there and stared at him, he couldn’t have fast track and sit there all by himself! 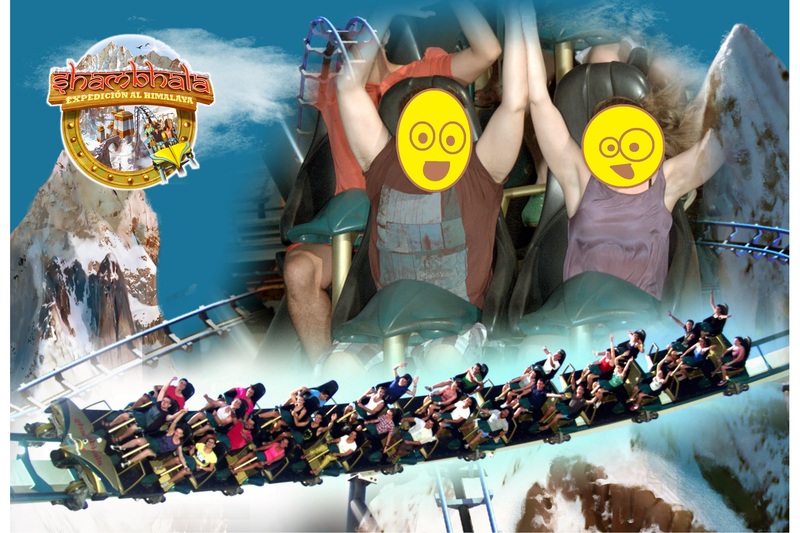 Luckily the ride attendant saw this and told him “no” and to join his buddy in the third row. 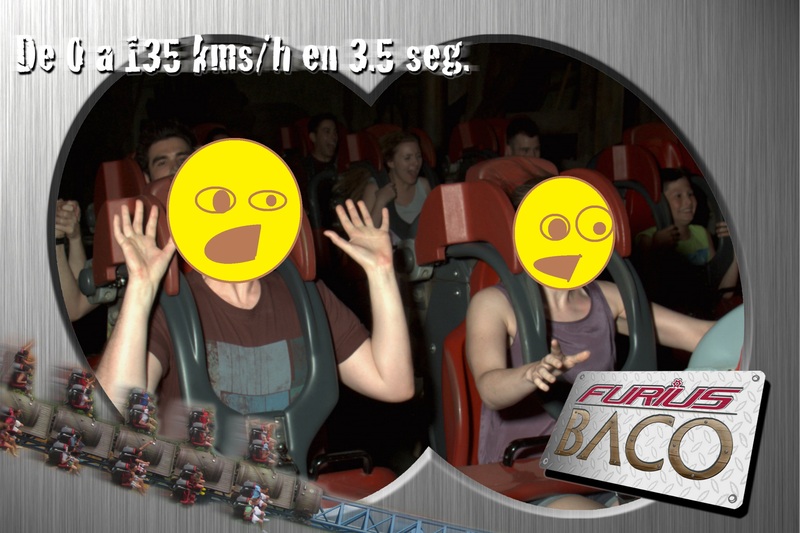 Then James and I jumped into the front row and woosh, best ride of the park! Do not read this paragraph if you don’t want to be spoiled. Skip to the next ride. I had no idea what this ride was besides a mini version of The Swarm and only found out seconds before we sat down. But, if you’re interested, here is the picture! So Furius Baco would appear to be about a mad monkey who turns on the vineyard owner and flies him off on a barrel? I had no idea what the theming was about but it looked interesting! I was not fussed for this ride as we queued. Having done winged rollercoaster ‘The Swarm’ at Thorpe Park I imagined this was a mini version. A test version before creating awesome ones elsewhere. I was wrong. This is the fastest coaster in Europe, going 0-83mph in 3.5 seconds. It is faster than Stealth. Stealth and The Swarm combined. This was a hit and miss ride though. We did it four times, two were fantastic and two were a headache. I think this was because this ride has loops, very tight loops. Stealth and Rita (UK quick start rides) do not have loops. The Hulk (Florida quick start ride) has loops but on a larger scale, so you can adjust better to being upside down at that speed. Furius Baco had corkscrew type loops, which even on Collosus gives me headaches, but sometimes it didn’t have any affect and other times I couldn’t quite enjoy it. Very Marmite ride. A strong, looping roller-coaster. However there was nothing special about this one. It is just a very standard roller-coaster. When we’re at Thorpe Park we don’t do Detonator. Drop rides were not my favourite. There is a real change in your body on these rides that I don’t often feel on roller-coasters. But having seen this ride from our hotel balcony I knew I had to face it. James was also reluctant but wanted to do it because I did. Try to get yourself onto a seat facing you as you walk into the ride. On this side you get great views of the park. On our second go we were sat on the opposite side and had a great view of the car park. It is a must ride though, just to say you’ve been up there. A proper old wooden roller-coaster, prepare for a head bashing! This has a cool aspect where you choose a team, red or blue, and then the coasters race each other. It means more people ride at a time and there is a sense of community on your ride. From what we saw on the day it would seem Red always wins, but either side you get the same thrills. This was a weird one. We saw the queue line by chance, almost missing this entirely. We joined the queue and I checked the park map to see what this rollar-coaster was and it clearly said this was a children’s ride. But the entire queue was adults. Everyone on the ride were adults. Each train was full of adults! Being a child’s ride you can only sit one adult per seat (with the expectation that a child would be with them!) so James sat in front of me. This was a strange set up, we’ve always sat next to each other! It was fun, but I wouldn’t want another go. Both good strong water rides. The rapids especially were a lot better than UK versions we’d been on. On our first ride through we had a boat to ourselves which is great for moving between seats to avoid sprays of water. Second time around we weren’t so lucky! Tutuki Splash is a Tidal Wave type ride with a longer route. Wasn’t fussed about doing this one again though. From the title we guessed what would be inside was a secret. We were quite unsure but enjoyed the thrill of not knowing what we were queuing for. Added to that, a member of staff was handing out plastic gloves. What the heck were the for? I was a little disappointed to find that this was a mirror maze. They don’t work well when (a) you’re at the back of a queue of people walking in together and (b) you have a member of staff walking quickly behind you. We tried to loose everyone so we can appreciate it for ourselves, then we got lost. The people coming in behind us caught up and we ended up leaving with a different group of people. It was okay, probably quite exciting for the children. Meaning the temple of fire, on this show we followed an explorer as she made her way into a cursed temple. This was a show all about effects, fire, water, lights, to make an atmosphere. The lady running the show was really good too and got the loudmouths in the crowd to shut up. I’ve seen shows like this before, but it was still fun. Now, I’ve failed to mention so far that I once visited Port Aventura as a 9 year old child. I went with my Mum and brothers and remember having a fun day. I didn’t remember anything we did though, aside from this 4D experience. In those days it followed a dolphin who was taking you on a tour of his undersea world. Now, the dolphin has been dropped but you still adventure under the sea. It was fun, I like a good 4D experience ride, but for me it was the nostalgia. Even the half submerged submarine is still sitting outside. So strange to return to somewhere I only once visited as a child. So we reach the end of our adventure. We enjoyed our days at Port Aventura (the first day was better, as we battled bigger queues on the second day) but decided there wasn’t anything too thrilling here to make us wish to return. Shamballa was the clear highlight for me, I would love to ride that one again and again. But for now, it is another theme park ticked off our world list! 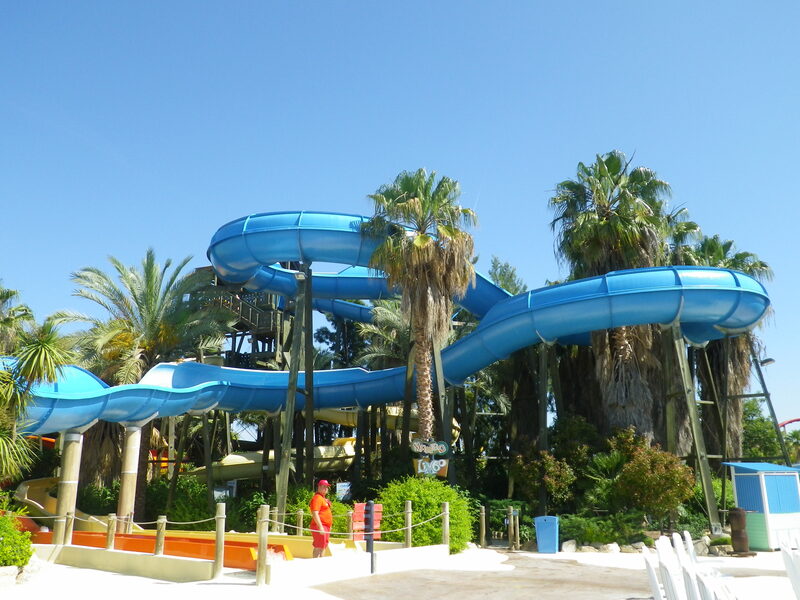 Heading to the north east coast of Spain and looking for some water park fun? There are two aquatic parks relatively close to each other within the Costa Dorada. Costa Caribe (linked to the massive Port Aventura theme park) in Salou, and Aquopolis in La Pineda. 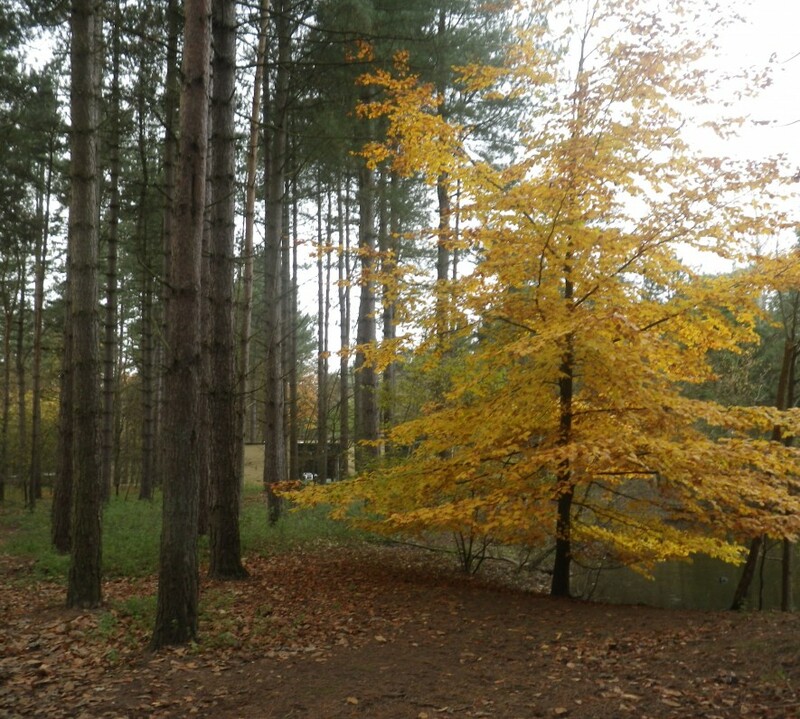 We visited both, and I’d like to share my views on how they compare. I’m not here to discuss the costs, there are deals you can find for both, and it would be difficult to compare as we purchased our entry to Costa Caribe as part of our Port Aventura entry. If you’re looking for variety, head to Aquopolis. 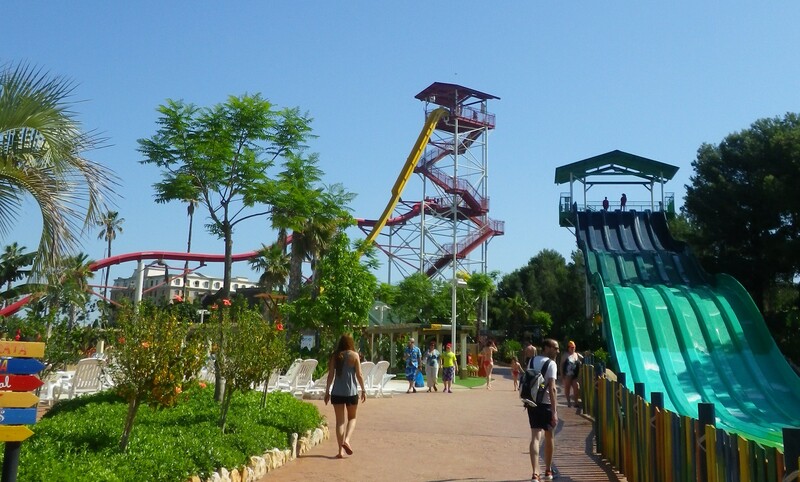 If you want Europest tallest drop slide, head to Costa Caribe. Aquopolis has plenty of boat slides (including a dark one), a rather strange rapids, a race slide, a boomerang slide and an awesome drop slide ridden on a board that if you keep your balance right you fly straight across the water without ever touching it. Costa Caribe has Europest tallest free fall water slide. For thrill seekers this is a must. But aside from this the park has standard water park attractions. Regular water slides, a race slide, a regular lazy river. My preference would be to add the free fall waterslide to Aquopolis and you have a perfect water park. The cost of the lockers were similar, a couple euro plus a deposit. At Costa Caribe you are issued a fabric wrist purse with the key attached inside by elastic. At Aquopolis this is a standard plastic wrist strap that is more uncomfortable. For both parks you need to head to a staff booth the purchase a locker key, this is more noticeable at Aquopolis than Costa Caribe (we wandered around a fair bit before we understood how the locker system worked). Unfortunately we arrived at Aquopolis for opening and had to deal with this awful queuing system. If they allocated more staff to letting people in than standing around with cameras everyone would actually be able to enter at their advertised opening hours. This put us in a rather stale mood at the start of the day. Staff were fine, but didn’t inform us that one of their attractions was not working. Instead they pointed us in that direction and let us find out for ourselves. We were late entering Costa Caribe so don’t know if they have a similar queuing problem at the start of the day. We were issued barcodes on entry too which gave us access to ride photos. A really neat idea. I also left my necklace on by mistake, which was pointed out to me by staff after my first slide so I got this put away straight after. 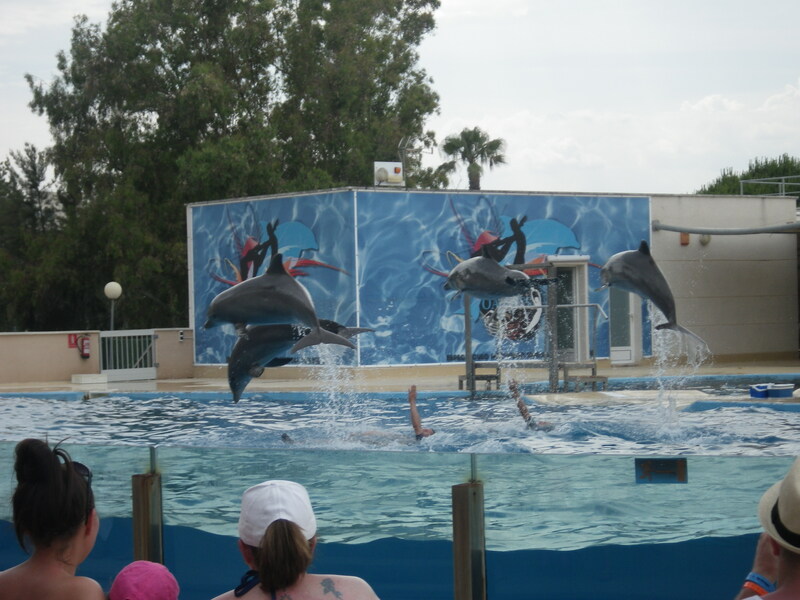 Aquopolis also has a dolphin show each day at 4pm. Perfect way to end the day (though it is open until 6pm). There are also interaction sessions at an extra cost and we had our photo taken with a sea lion. We didn’t buy the photo but it was great to just get up close. Aquopolis also has a lovely beach area for relaxing, compare to Costa Caribe which just has standard sunbeds by the pools. A mini golf course and a surfing attraction can also be found at Aquopolis, but these were not open during our early June visit. Unfortunately Costa Caribe doesn’t have anything extra to talk about, aside from the fact it is next door to Port Aventura. But obviously there is an extra cost for this. It does have an indoor pool and slides, but I hope you don’t need to use them. Actually, an extra Costa Caribe has that Aquopolis doesn’t is the freedom from pushy photographers. I know I’m enjoying my day, and I have a camera if we need some photos to remember it. Please leave me alone! So I have missed off anything the kids will like. As a childless couple these were not things we looked at so cannot comment on the better of these. To conclude, as I said above, the perfect match would be to have the thrill ride of Costa Caribe’s free fall slide within the greater water park of Aquopolis. I would say I had more fun at Aquopolis and haven’t even gone in to all the other exciting activities this park has to offer.